Last week, we installed a brand new teak shower mat in Mountain Laurel. It goes really well with the wood framed two-person Jacuzzi tub in the bathroom. Innkeeper/engineer Dave loves this shower mat because it’s “fantastically solidly built”. The smile on his face when he opened the package was priceless. 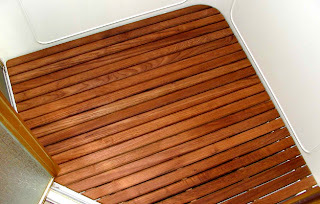 We’re happy to know that the supplier uses teak that is “reclaimed, sustainable teak” meaning a replacement tree was planted 20 years before the teak they used was harvested.